I was decorating an outdoor space ready for a birthday party recently. We really wanted to hang some balloons but didn't have any on hand, and so we decided to try our hands at making something with paper instead. We wanted something that we could hang up and that would sway in the wind a little. I had been looking at these beautiful paper tulips and thought that was a good place to start. We had two things to consider: that we only had white paper available, and how would we hang them? We decided a yellow flower center would look nice and add colour. To make the yellow centre, we took a tissue and dipped two sides in watered down yellow food colouring. The tissues were then hung up to dry for a couple of hours. 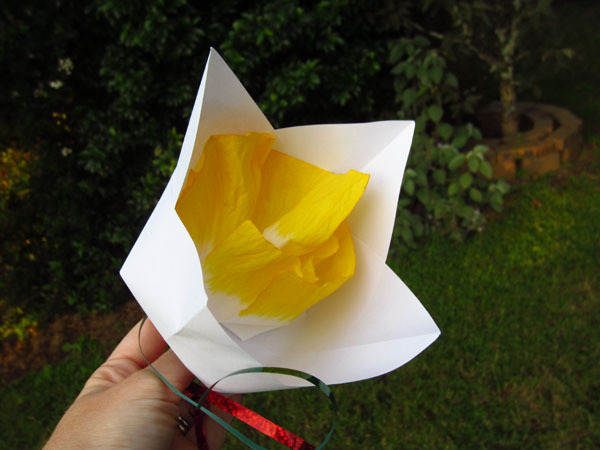 When they were dry, we tied string around the centre of the tissue so that it looked like a bow, and threaded the string through a hole in the bottom of the flower. We made 3 different sizes of flower to add some variation, and hung them around in small bunches. If anyone uses this idea, I'd love to see what improvements and variations you come up with.